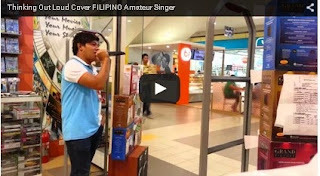 Another talented person took the liberty of singing in the mall. He was singing the popular song “Thinking Out Loud” of Ed Sheeran. Well, if only Ed Sheeran could hear this guy sing, he will surely say that the “guy has done justice to my song”. He has a good voice and anybody who hears him sing can say that he sings like Ed Sheeran. Oh well, Filipinos are really talented! This guy will surely go a long way if he will be given a chance to prove what he’s got. Hope some talent out there will hear him sing.